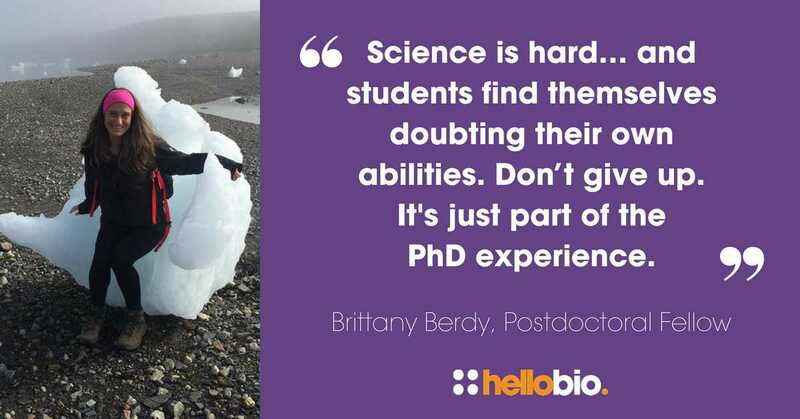 As scientists ourselves, we know how daunting it feels when you embark upon on your first PhD. Especially right at the beginning, when everything can feel totally new and overwhelming. Whilst 91% of the life scientists who took part in our Big Life Scientist Survey said they’re passionate about their research, only 25% said they feel there’s adequate support for early-career life scientists. To show you just how much support there is for you in the life science community from your peers (and from us!) we’ve put together The Life Scientists’ Guide for New PhD Students. Here, you’ll find the fantastic advice our fellow scientists have shared with us, as well as a few tips from our personal experience. If you know you want to pursue a PhD and you’re looking at your options, there are a couple of things to consider right at the beginning. These two pieces of advice might well be the most important ones, because they’re going to make your entire PhD experience less stressful and more rewarding in the long run. Dr Bryan Roth, Professor of Pharmacology at the University of North Carolina Chapel Hill School of Medicine, has worked with many PhD students over the course of his 35 year career. Don’t follow the route of academia just because you feel like you should. You have to truly love what you’re doing and believe in the importance of the results you’re pursuing. If you have doubts about your subject, or the level of commitment required to complete a PhD fills you with dread, then it might not be the best option for you right now. There’s absolutely no shame in taking a step back and having a rethink. Even if you’re the most dedicated scientist in the world, there’ll be times when things don’t go as planned and you doubt yourself. This is perfectly normal, and something that every postgrad experiences at some point in their career. Trust us. And this is where having an awesome supervisor will be essential. “There will be times you will struggle with motivation towards your project, and if you have a good supervisor they will help guide you and keep you on track,” says Rachelle Balez, PhD student at the Illawarra Health and Medical Research Institute. So you’ve just started your PhD, and you’re probably feeling like a rabbit in the headlights. We get it, and there’s no need to panic! You’re part of one of the most supportive communities out there, and we have all got your back. Here are our top tips for getting through those first few months. Right at the beginning of your PhD, set time aside to read as much as you can about the existing research and theory relating to the field you’re about to delve into. It’s not just the topic you’ll want to research either. “Get familiar with the techniques you plan to use too, so that you can design your experiments appropriately,” says Dr Samantha Murray, a researcher at the University of Otago. The end goal of your PhD is your thesis, meaning you’ll want to do everything you can to prepare yourself along the way. If you get the right processes in place from the beginning, and start as you mean to go on, ‘future you’ will be very thankful to ‘past you’. 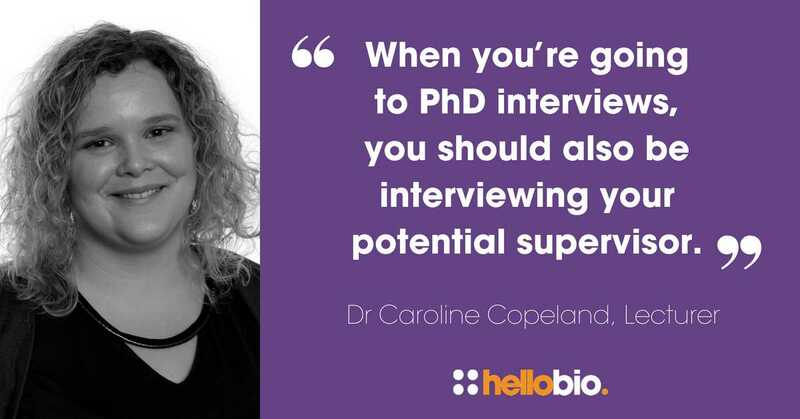 Your PhD supervisor will be your mentor, your champion, and your go-to when things don’t quite go as planned. That means having a great relationship with your supervisor is hugely important when it comes to determining the success of your PhD. As you get further into your PhD and gain confidence in what you’re doing, things will start to feel far less daunting (we promise!) That doesn’t mean there won’t be challenges, but believe us, you’re more than capable of dealing with them. When it feels like the stabilisers have come off and you’re getting in your flow, here’s how to keep focused and on track. Taking ownership and being a leader doesn’t mean you have to know it all though. “Don’t be shy, always discuss your doubts with your supervisor and colleagues who have more experience,” says Agnese Solari, a PhD student at the University of Genova. 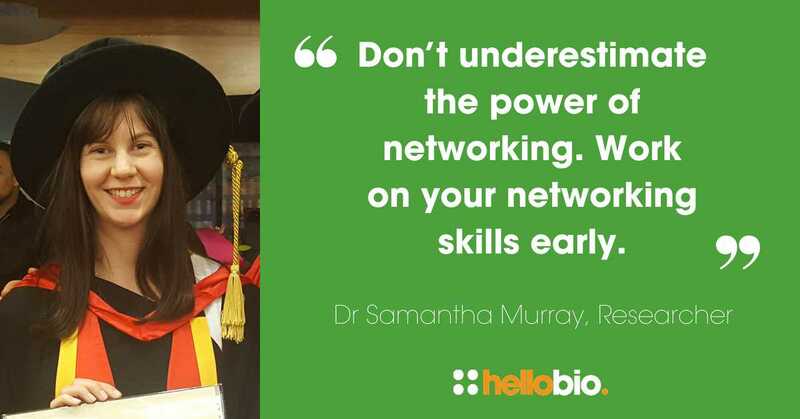 In starting your life science PhD, you’re stepping into a hugely supportive community both offline and online. There are a whole host of incredible scientists out there, willing to offer advice, encouragement, and opportunities. You’ve just got to get involved. And it’s not just networking at conferences and events that will help you. 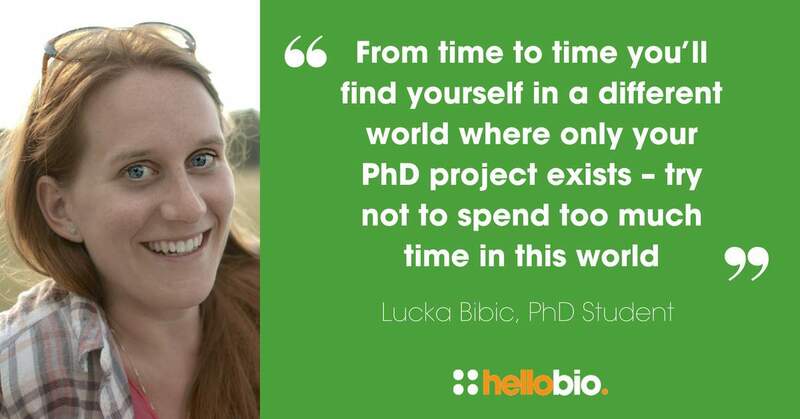 Tap into online communities as well: “Read the PhD comic strips, sign up to Twitter, and surround yourself with other PhD students that are going through the same process as they might be of great support to you at some point!” says Lucka Bibic. As anyone who’s worked as a life science researcher will tell you, you’re definitely going to experience ups and downs. Whether you make a mistake and have to start from scratch, you don’t get the results you’re after, or your project just doesn’t seem to be going to plan, keeping positive is important. “If things are going horrendously badly in the lab remember that it is not the end of the world and negative results are still important,” Chloe Thomas, a PhD student at University of Birmingham, advises. Don't be afraid of making mistakes, and don't give up! And his mistakes didn’t work out too badly for him, did they? “Don’t get discouraged. In many cases people starting their PhD were top of their class, totally awesome students who excelled during their undergraduate years. “All of a sudden they’re thrown into this world where everyone is incredibly smart and creative and top of their class. It’s easy to get discouraged and wonder if you are in the right place, studying the right thing. And then experiments start to fail! Constantly! “Question deeply. Read deeply. Think deeply.” This is the advice of Dr Tim Mosca, Principal Investigator at Mosca Lab at Jefferson University, Philadelphia. By embarking on a PhD, you’re bravely going where few others have gone before you. This requires courage and thorough investigation. Always go deeper. Dr Tim Mosca goes on to say: “The ethos that you build now will serve you for the rest of your career. Don’t just focus on one narrow area. Learn what your colleagues and fellow students are doing. If you’re a molecular person, learn systems. This is your chance to really immerse yourself in academia. Of all the life scientists we’ve spoken to over the past few months, this is a theme that comes up time and again. Don’t be afraid to ask questions and push the boundaries of your learning. “Don’t be afraid to be wrong, and don’t be worried about saying I don’t know,” says Hello Bio’s Director of Commercial Operations, Dr. Huw Davies. It’s easy to get consumed by your PhD. After all, it’s a huge part of your life. Remember though that you can, and absolutely should, have a life outside of your PhD. Achieving a good work/life balance is key to your success – after all, you can’t perform at your best if you’ve run yourself into the ground. The results of our Big Life Scientist Survey support this further. 73% of life scientists we spoke to feel their ability to do their job is impacted by high levels of stress. Taking control of your stress levels and actively focusing on your wellbeing now will only serve to help you further down the line. It’s easy to get consumed by everything that’s not working, but remember to take time out to celebrate the incredible progress you’re making. Always remember that you’re doing something hugely worthwhile. “It’s important to set achievable research goals and celebrate successes, no matter how small, as they happen. After all, every small success (and failure for that matter), gets you closer to the result you’re looking for,” says Lizzie Mann, a PhD student at King’s College London. Your PhD is likely to be one of the most stressful and all consuming things you’ll ever do. As we’ve already said though, the life science community is huge, and extremely supportive. We understand the challenges you’re facing, so don’t be afraid to reach out and talk to someone. Your PhD is going to be a BIG part of your life for the next few years. This means, you’ve really got to enjoy what you’re doing, and have fun while you’re doing it. Above all, when things get difficult, take yourself back to the reason you started all of this in the first place. And give yourself a huge pat on the back for how far you’ve come. Apply for a Travel Grant: every month we give away $500 to PhD students and Postdocs so that they can attend a scientific conference. Give it a go - it's really easy to apply. 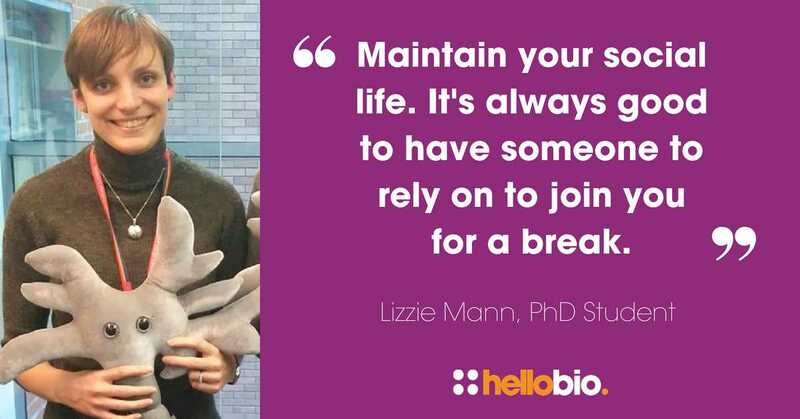 And don't forget to check back in to the Hello Bio Blog - with features from experts, posts on lab support, events, competitions and some fun stuff along the way!